If you decide that the product you purchased from us is not exactly what you were looking for, or is the wrong size, there is no problem returning it to us. We will accept products back for exchange or a full refund as long as it is with its original packaging, receipt and the product itself unused or unworn. We cannot refund postage. If 14 days have gone by since you have recieved your order, unfortunately we can’t offer you a refund or exchange. If you are approved, then your refund will be processed, and a credit will automatically be applied to your original method of payment. This usually occurs within 24 hours, but please allow 2-3 days to allow for refund to be cleared by your bank. If you haven’t received a refund within 2 weeks, first check your bank account again. Next contact your bank. There is often some processing time before a refund is cleared. If you’ve done all of this and you still have not received your refund yet, please contact us at orders@jonzara.com. 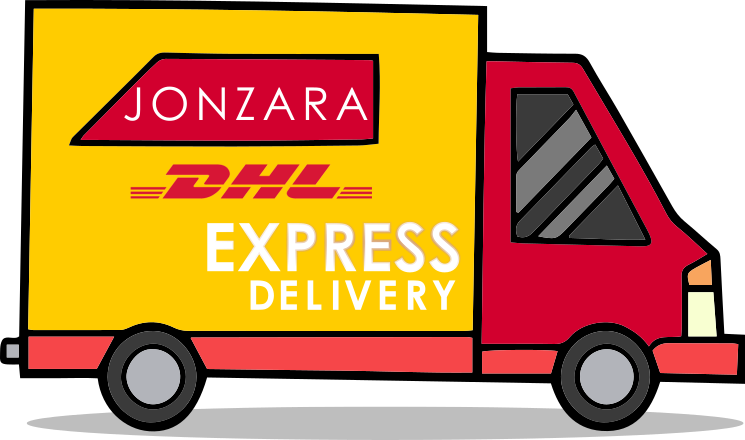 If you need to exchange an item for a different size or colour send us an email at help@jonzara.com and send your item to: Jonzara, 20 Bow Street, Lisburn, BT28 1BN, United Kingdom. You can choose to use our easy returns label on our returns form, if you decide to send your order back yourself, you will be responsible for paying for your own shipping costs for returning your item. Shipping costs are non-refundable unless there is an error on our end. If you are shipping an item over £40, we recommend using a trackable shipping service.